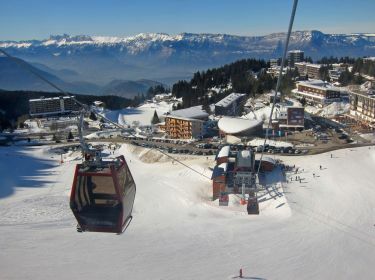 This mountainside, the ski birthplace of Chamrousse, offers the most difficult slopes of the ski area (red and black ones) but remains accessible to beginners. This is the most wooded part of the ski area and you can ski among fir trees. Some areas are not groomed to enable skiers looking for powder to practise safely. A real treat ! In Chamrousse 1650, you will also find the famous runs of the 1968 Olympics (6 events and the birth of great champions). Just ski these legendary runs to go back in time ! You can start from the summit of the ski area, called la Croix de Chamrousse, and ski them down to the heart of the resort. The Mens mythical descent, won by Jean-Claude Killy, on the other hand, will take you to the lowest point of the ski area, called Casserousse (1400m). Be aware that the draglift taking you back up is long and not adapted to young skiers or beginners. La Croix gondola, built in 2009, takes you directly to the top of the resort. At "La Croix de Chamrousse" (2250m), take some time to enjoy the 360° panorama. A magic view of all sur­rounding mountain ranges (Oisans, Vercors and Chartreuse), of Grenoble and its valleys. From there, you can reach all parts of the resort. "Les crêtes", a large blue slope, will take you down to Chamrousse 1750. From the summit, ski deeper into the Belledonne mountain range taking the "Lacs Robert" slope, and get to the lakes with the same name. You can go ice diving in these frozen lakes, which are snow-covered all winter. For hard-bitten ones, don’t miss the famous "Casserousse" corridor (black ungroomed slope), where you will discover another landscape and have the feeling of being alone in the world.